RENTS FOR PROPERTIES close to Dart stations and Luas stops rose by 3% to an average of €1,770 per month in the first three months of the year. This means that renters living close to Dublin’s rail network are now paying for a premium of €3,360 per year (17%) compared to the average rent for Dublin. The new report, published by Daft.ie, analysed the average rental prices for one and two bedroom properties close to each of the 125 stops and stations in the Greater Dublin Area between April 2017 and March 2018. It delivers these rentals prices on a stop-by-stop map. The report found that commuters living on the Dublin coastline pay the most on average, with rents close to the Sandymount Dart station averaging €2,282 per month. Renters close to the Sandymount Dart station, the most expensive station to live by, pay on average double those living near the Cheeverstown Luas (€1,056 per month), which has the least expensive rents on the maps. In terms of the Luas stops, homes close to Spencer Dock on the Red Line appear to have the highest average rent prices at €2,260 per month. Meanwhile, those living close to the Charlemont stop pay the most on the Luas Green Line, with average rent prices at €2,091 per month. Daft.ie also analysed the average rent for each stop on the Luas Cross City line, which opened in December. Properties close to the new Dominick stop were the most expensive on the line, with average monthly rents of €1,894. Overall, the most expensive Dart stations to live near were Sandymount (€2,282 per month), Pearse (€2,226 per month), Dalkey (€2,205 per month), Lansdowne Road (€2,175 per month) and Grand Canal Dock (€2,145 per month). “The increase seen in the cross-city Luas stations between Q4 2017 and Q1 2018 is similar to the rest of the city for rents, with both rising on average 3% in the same period,” Economist at Trinity College Dublin Ronan Lyons said. “Given the service only started operating at the end of 2017, this shows that when estimating the effect of investments like the Luas Cross City it is important to factor in anticipation effects, that is, sale or rental prices rising ahead of a new amenity opening up in an area,” he said. Based on this data, it appears that the rental market on the Luas Green Line has now adjusted to the new service. Note: TheJournal.ie publisher Journal Media Ltd has some shareholders in common with Daft.ie. Email “Rental prices: These are the most expensive Dart and Luas stops to live next to ”. 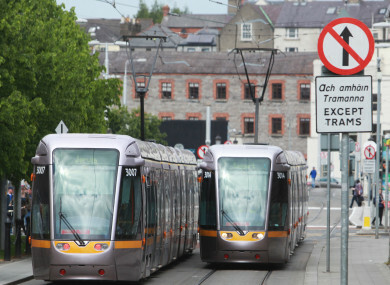 Feedback on “Rental prices: These are the most expensive Dart and Luas stops to live next to ”.